Wright Kennedy specializes in geographic information systems (GIS) and spatial analysis to study past and present health, environmental, and socioeconomic issues in cities. He has investigated a wide range of urban topics with GIS, including epidemics, streetcar corruption, hurricane recovery, and shifting environmental disease burdens linked to Jim Crow and residential segregation. 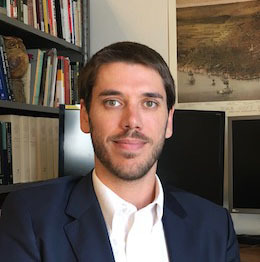 He is a lecturer in the History Department at Columbia and the Postdoctoral Research Scholar on Mapping Historical New York, a spatial history project on immigrants and neighborhood development in the city during the nineteenth and twentieth centuries. His teaching interests include spatial history methods, urban geographic history, and the history of medicine. Kevin Loughran, James R. Elliott, and S. Wright Kennedy. “Urban Ecology in the Time of Climate Change: Houston and the Case of Water,” Social Currents (accepted 2018). Wright Kennedy, Jessica C. Kuzmin, and Benjamin Jones. “New Methods in the History of Medicine: Streamlining Workflows to Enable Big-Data History Projects.” Medical History, Media Review Series: Teaching & Researching the History of Medicine in the Era of (Big) Data, 61, no. 3 (July 1, 2017).